PC-Marine™ Epoxy Putty Stick is a specially formulated epoxy putty suitable for wet or underwater applications. Incredibly it has an extended open time (20 – 30 minutes) but cures hard within 60 minutes for a fast return to service and emergency repairs. It sticks great to metals, fiberglass, tile, wood and some plastics such as ABS and rigid PVC. Remove contaminants such as dust, dirt, oil and grime with a solvents such as denatured alcohol, acetone, rubbing alcohol (isopropyl alcohol) or lacquer thinner. Mild detergent solution in water is also good removing contaminants. Use a clean paper towel or rag for wiping. Do not use mineral spirits or paint thinner for removing contaminants. Smooth, glossy and shiny surfaces should be roughened using sandpaper to increase adhesion. Wear disposable gloves to minimize contact with skin. Use denatured alcohol, acetone, rubbing alcohol (isopropyl alcohol) or lacquer thinner to cleanup before PC-Marine cures. Can PC-Marine™ be applied underwater? Yes, application underwater is possible. PC-Marine™ will adhere and cure underwater. However, it is preferable to apply it in dry conditions. 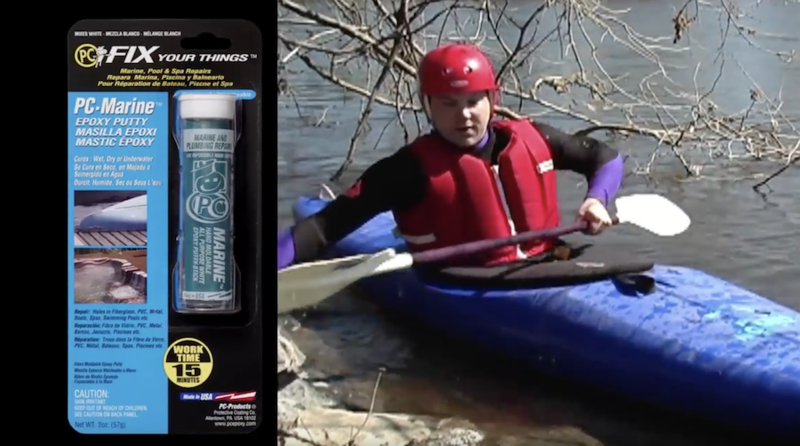 Is PC-Marine™ suitable for repairing canoes? 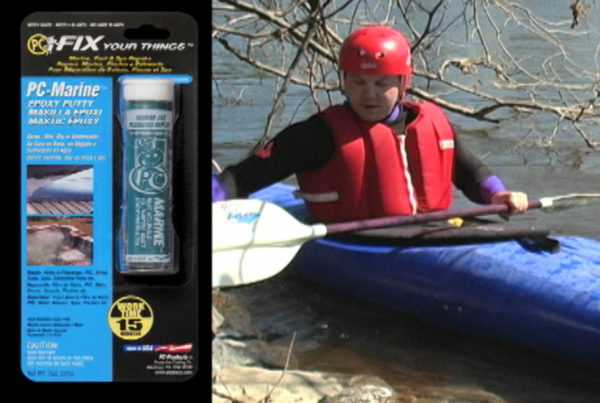 PC-Marine™ is excellent for repairs to aluminum and fiberglass canoes but not when they are made with Hypalon. How much time does it take for PC-Marine™ to cure? PC-Marine™ has an extended application or open time of 20 minutes. Most repairs made with PC-Marine™ can be returned to service after 60 minutes. Some applications may require full 24 hour cure. 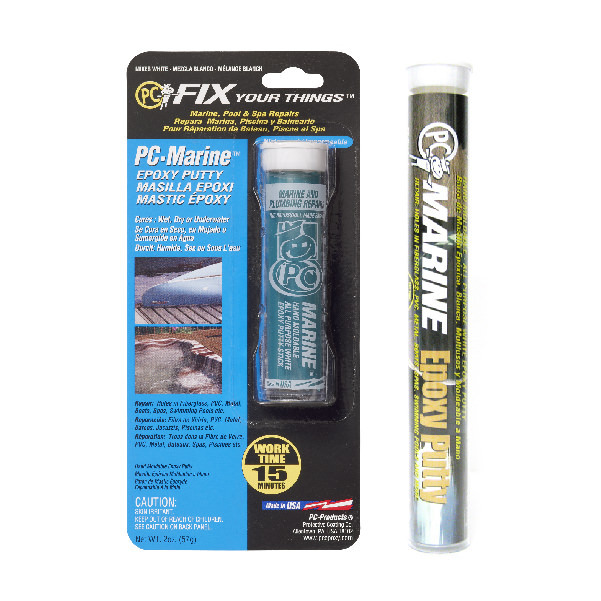 PC-Marine™ Epoxy Putty stick is white on the inside and green on the outside. The green color disappears when mixed with the white. The result is an off-white color when it cures. What is the maximum thickness that PC-Marine™ Epoxy Putty can be applied? PC-Marine™ can be applied thick or thin. There isn’t a thickness limit. It cures from the within via a chemical reaction. It does not need to dry or be exposed to air. How much PC-Marine™ can be mixed at a single time? 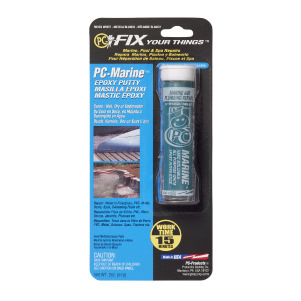 PC-Marine™ is slower curing than other epoxy putties allowing larger portions to be mixed at one time. Small quantities can be mixed more thoroughly and with less effort. Can PC-Marine™ cure in a freezer? PC-Marine™ is not recommended for sub-freezing temperatures. We recommend application temperature of 35 °F or higher. PC-Marine™ does not cure to pure white color, it is considered off-white. It is possible to touch up cured PC-Marine™ with stain sealing primer and paint. The open time or application time is reduced at elevated temperatures. Expect the open time to be reduced by 5 to 10 minutes at 100°F (38°C).